Firefighters Beyond Borders international delegation to Israel for Wildland Urban Interface Exchange in November in which six firefighters from three different local agencies will travel to Israel to learn and share practices, strategies, and science involved in protecting our firefighters in the emerging Wildland epidemic in both countries. 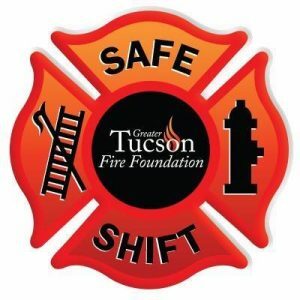 -Firefighter and Family Mental Health Challenge Grant; a benefactor has again offered a $20,000 donation match for firefighter and their family mental health programming. Each dollar raised will be matched dollar for dollar up to $20,000. Safe Shift Estate Sale Resale store as the main source of ongoing fundraising effort. Even though the store at 4911 E 29th in Tucson is open just three days a month, each sale is like an event unto itself with well over 200 volunteer hours going into each month’s sale. A keyword in these initiatives is “volunteer”. The level of work done in support of our region’s firefighters with an ALL VOLUNTEER force is unparalleled in this country. The all-volunteer Fiesta De Los Bomberos Committee is a group of professionals who continue to come forward and work for their passion to save firefighters careers and lives. Countless hours have gone into making this year’s FDLB/NFFF event one of the best grassroots events in the region. Again, with an all-volunteer force. Thank you for your support of our firefighters.